New York last week, Great Yarmouth today. I’ve never been to Yarmouth before. It’s a really lovely town. I tend to think of British seaside resorts as being rather sad, diliapidated places. The one I know best, Weston-super-Mare, certainly is. But Yarmouth was very busy with holidaymakers, making the most of a beautiful day. I sat on the seafront, drinking tea, eating scones and cream and looking a complete idiot as I tapped away at my Blackberry and spoke on my mobile phone to a member of my Board in London who wanted to discuss an urgent matter with me. All around me were people relaxing and having a splendid holiday. There I was, doing everything I could to present myself as a sad urban businessman, unable to throw off the shackles of the office. The scone was nice though. It’s a windy place. 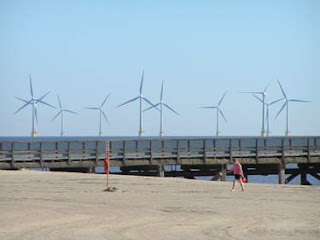 I took a photograph of the windfarm you can see from the beach. I don’t think I’ve ever seen so many turbines together – It’s pretty impressive, and didn’t seem noisy, but perhaps the wind was in the wrong direction for me to notice. I was in Yarmouth to speak to the Scout Leaders of East Norfolk at their Annual General Meeting. They had an excellent turn out. I would say that about fifty people were present, which is pretty good for an evening of reports, accounts and elections of officers. It was clear from the reports that Scouting in East Norfolk is thriving. They’ve seen a 10% rise in numbers over the last year. They’ve been doing some terrific activities and this weekend over 600 of them will be camping together to celebrate the centenary of the Scout Movement. Their District Team is enthusiastic and motivating – led by a terrific District Commissioner and Chairman. I left feeling pretty motivated myself. Scouting’s a great game when it works. And in Great Yarmouth, it clearly is.